Push notifications drive 9.6x more users to purchase and increases in-app spend by 16 percent. 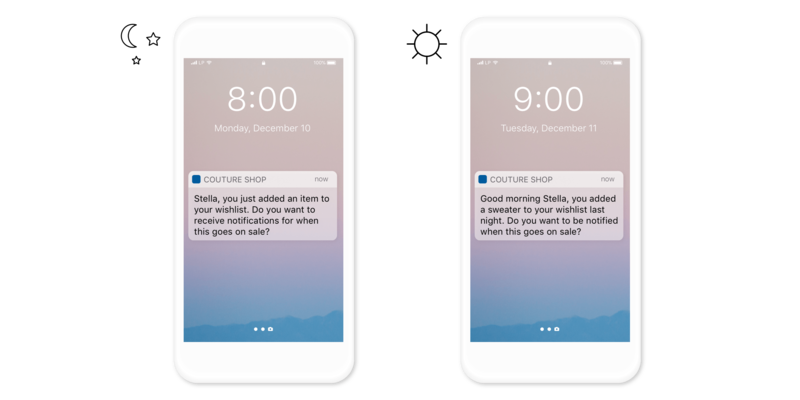 Use Leanplum to send push notifications to users at just the right moment to entice users to engage and spend more money inside your app. By connecting at just the right moment, you increase the chances a user will purchase and decrease the chance they’ll be annoyed. Rather than request an in-app purchase from all of your users on a fixed schedule or at a certain point in your app, you can tailor the request to each user and catch them during a moment of happiness. Don’t send a popup that disrupts the user experience. Set a Leanplum message to appear during key moments in the app, such as after a user levels up in a mobile game, adds an item to their wish list, or watches their fifth video. Test what works best and adjust the campaign on the fly. With Leanplum, you can A/B test the message and see which settings lead to the most in-app purchases. Pick the winner, and rest easy knowing that the best version is being sent to your users. See how to increase revenue with upsells and cross-sells.